Huh? A what? A SLOTCAR! A slot car is a miniature replica of a full-size automobile or race car which is driven on race tracks or drag strips every weekend during the spring, summer and fall. With slot car racing there is never a time when play is halted because it is popular year-round. You do not have to be outdoors getting sunburned. Slot car racing doesn’t stop when it rains, when the weather is scorchingly hot, or when it’s windy, cold, or if there’s snow on the ground. The enthusiasts enjoy the comfort of nice, clean environments, heated in the winter and air-conditioned in the summer. You can race your cars for a couple of hours cheaper than the purchase price of a theater ticket & popcorn, as well as have a lot more fun! Slot cars are powered by small electric motors which are run by direct current (DC) power supplies and/or storage batteries, similar to what is in a full-size car. The car “follows” a groove (or slot) which has been cut into the track or table surface with a router. Slot car racing surfaces can be set up with as few as two or more “lanes” with the typical commercial track having up to eight lanes per track layout. On either side of the “slot” are “positive” and “negative” pick-up contacts which are made from either copper tape or stranded “braid” which is made from the copper shielding used in many electrical cables and glued into place. Attached to the front of the car is a plastic “shoe” or guide “flag” on which are affixed two more strips of this same type of braid. This “flag” swivels in both directions and follows the slot in the track. Two small wires are soldered between the guide flag braid and the positive and negative terminals on the small motor. The car is “driven” by the participant with the use of a “hand control” which has been hooked to the drivers station panel. The “racer” actually “drives” the miniature car in much the same manner as driving a “real” car. By pulling on the “trigger” of the controller, current passes from the track power source through a set of relays, through the braid on the track and the car, to the motor, and through the resistor in the hand unit. The further the trigger is depressed, the quicker the car will run. Slot cars also have “brakes” but not in the sense of your big car. Braking occurs by letting completely off the trigger of the controller, allowing it to go to the “off” position. Because the small electric DC motors have “north” and “south” pole magnets in which the armature spins, letting off the controller completely makes the motor act like a generator and try to (although it doesn’t) “back up.” This electrical action causes the car to stop very, very quickly. As with any hobby or sport, this too requires practice to become good at it. Drive too fast into a corner and the car will “de slot” – or come out of your groove. Drive too slowly and everyone else on the track will be passing you. The truly exciting part about slotcar racing is that it is absolutely the world’s fastest motor sport! There has never been, nor will there ever be, a motor sport as fast as slotcar racing! Imagine a full-size car capable of moving around a race track in excess of 2400 miles per hour! In slot racing, your “scale” speed can actually be that fast! No, slotcars are NOT your run-of-the-mill “street” machine, and their scale speed is faster than Dale Earnhart’s #3 ever thought of going at Darlington or Daytona. 1/24 scale Dragsters of today routinely travel a scale quarter mile layout in less than a second – over 120 mph actual speed! Of course no one starts at this level unless they have more money than they know what to do with and no where else to spend it! But rest easy you can get started in this for less money than virtually any other hobby you can name. You can get everything you need and be racing immediately for less than the cost of one pair of Nike’s! Visit any commercial raceway in the United States and many parts of the world today, including South America, Canada, the Caribbean, Japan, Australia, and dozens of European countries and you’ll find slot car tracks. Granted, these places are not nearly so plentiful as they were in the 1960’s and 70’s when rent was much more affordable than it is today. The good news is that the prices for equipment, track rental fees, racing, and assorted components is far less than the rise in prices of all other forms of entertainment since the time slotcar racing was introduced to the United States in the 1940’s. 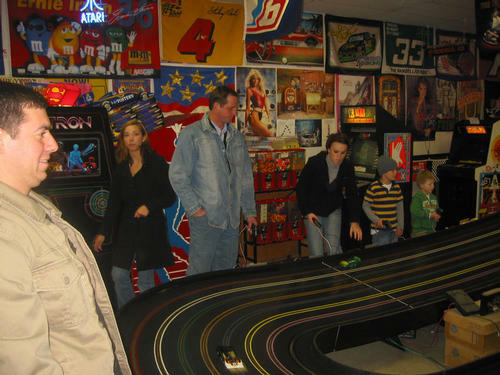 Slot car racing is not Nintendo, or similar in any way to any other type of “sedentary” activity. The only hobby that is remotely similar to slot cars is radio-control racing. You can’t “race” model trains! With rockets, there’s one “whoosh” and you strain your eyes to see where you hope you’ll be able to retrieve it once it returns to earth. It’s not boat sailing, kite flying, jigsaw puzzles or about flying airplanes. With slot racing there’s continuous high-speed “action” going on all the time! Whether you’re out there on the track by yourself just practicing; or racing against your friends, the adrenaline-pumping action is non-stop! No you don’t sit down and never move! You’re standing up, and getting some valuable exercise walking around the track – especially when you hit that corner too fast and your car flies off! 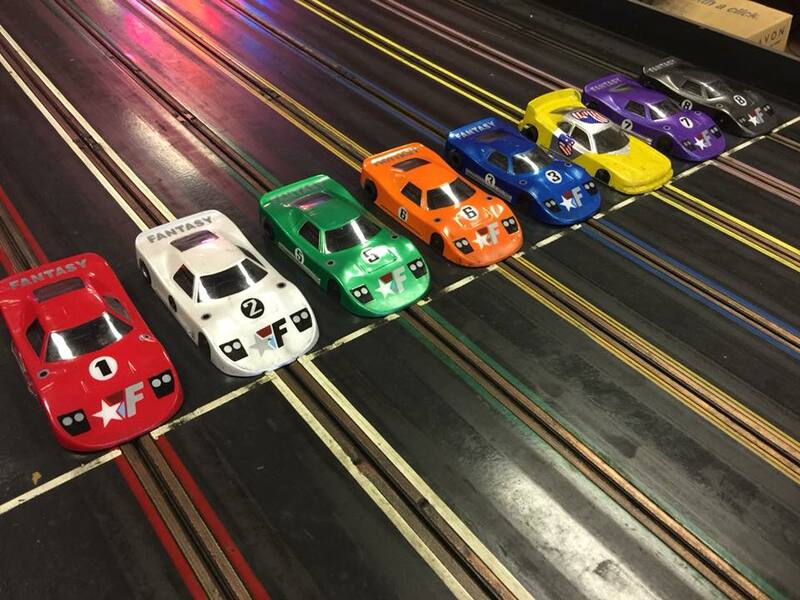 The different sizes and styles of cars are as varied in slot car racing as on the “big” circuits! Are you a NASCAR fan? There’s plenty of NASCAR and SUPERTRUCK competition available and in two sizes for 1/24 scale – 4″ and 4.5″ wheelbase. Do you thrill at the sight of open-wheel cars turning circles at Indianapolis? Do you watch television shows of road racing from places like Watkins Glen or any other race track around the world? Wouldn’t you love to drive one of those awesome machines? Well you can and never experience any of the life-threatening accidents that plague full-size race car drivers. Just go race a slot version of your favorite class of car. Walk into any slot shop and you’ll hear terms like “HO,” “1/32nd,” “1/24th” or “Drags.” It can be a bit overwhelming at first as you look into the showcases at the wide variety of body styles, chassis, motors, tires of every color, and the hundreds and hundreds of parts hanging on the walls and in storage bins. Don’t panic. Your friendly and professional track owner is a member of the Track Owner’s Association and is completely knowledgeable on every facet of this hobby. 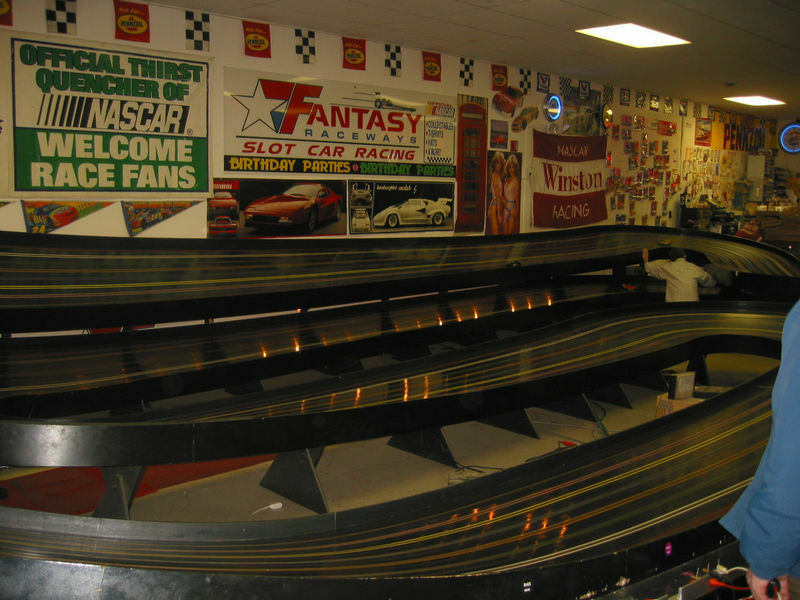 He or she – yes there are ladies who own commercial slot car raceways, is there to help you. Many of the charming ladies also race (very well, by the way) and a few have achieved national prominence, so never fear asking them questions. They will help and guide you in your purchases as well as take you through the early stages of your training. To assist you through some of the things you will encounter on your first visit, you will be exposed to at least two or three different sizes of slot cars. DRAG RACING – There’s nothing in this world short of the US Air Force’s “Stealth” fighter than can cover ground as fast ans as quick as one of these earth-bound “rocket ship” slot dragsters! You simply have to see it to believe it! If you?’e ever seen a real, live drag program at your local drag strip, there’s a class for the same style car in slot racing everything from old style cars raced using the “bracket” system, up to full-size “rail” jobs like “Big Daddy Garlits” and “Cha Cha Muldowney” ran a few years ago and pros today blister a one-quarter mile strip in less than 5 seconds. You think 1/1 dragsters are fast? Today’s 1/1 top-fuel dragsters typically turn in runs of 300-plus mph. In scale drag racing, a “rail” car can reach scale speeds of over 3000 mph! Drag Cars can run OVER 120 actual MPH and do it all from a standing start in only fifty-five feet using one tiny electric motor and sixteen volts of DC current! If straight-line racing is in your blood, you’ll never experience anything like slot car drag racing! 1/64, 1/87 (H.O.) Scale – Many people are familiar with this size of slotcar because hundreds of thousands of “home set” tracks are sold every year during the holidays and Christmastime. While this style of car looks small – (the cars are about the same size as “Matchbox” toys) – don’t let their size fool you! These tiny versions are some of the fastest, best-handling slot cars ever made. The reason they handle so well is due to a magnetic attraction of the cars to the track rails. H.O. racing at the commercial level has steadily increased through the years and many commercial raceways have tracks and sell cars and components. Many of these models are extremely affordable, but as speed increases, so does the price of the more exotic models. 1/32 Scale – This was the size of most model race cars in the early days of the 1950’s and early manufacturers such as Strombecker sold these by the zillions! Believe it or not, this is still a popular size and many places still race several classes. The most popular of this style car virtually saved slotcar racing from total extinction in the early 1970’s. The car was manufactured by Parma International, Inc. of North Royalton, Ohio. The length of the car was approximately 4″ but the front and rear tires extended outward to what is now allowed in 1/24th scale. Parma calls their car the “Womp Womp” (because that was the sound it made when it hit the wall). Champion Slot Racing Products calls their model the “Thumper” and in 1996 Champion released a line of 32nd scale “Legend’s” cars that are truly fun and exciting to race. There are several other styles, or “classes” of 1/32nd scale racing still being done today. These include Eurosport, Indy, and Dirt Oval as well as others. This scale of car is still being produced and put in home set tracks, sold by companies such as Scalectrix out of Canada and Ninco of Spain and imported to the United States. 1/24 Scale – Of all the available sizes of slot cars, 1/24th seems to be the most popular at the commercial level. The cars are approximately 6″ to 7″ in length with a maximum wheel/tire width of 3″. Within 24th scale, the two “wheelbase” dimensions (length from center of front axle to center of rear axle) are 4″ or 4″. Scale appearing means just what it says the cars closely approximate actual “big” car racing in appearance, and color schemes. Scale appearing slot cars are considered the more affordable, although at the higher levels of competition the cost can be more than a basic beginner car. “Winged”(Air Control) – car racing is centered around slot cars which do not closely resemble actual race cars, but are the absolute ultimate in speed and handling due to aerodynamic additions to the bodies which “channel” the flow of air. As the durability and speed of motors increased due to technological advances and many years of research and development costing millions of dollars, winged cars became extremely lightweight. While perhaps not quite as popular as “scale appearing” slot cars, winged car racing continues to hold the fascination of hundreds of enthusiasts. For them only the thrill of being able to negotiate the nearly impossible feat of going around corners as fast as a dragster goes in a straight line is sufficient. Today’s winged cars now negotiate very tight corners faster than 60’s slotcar versions went on long straightaways! Motors – This is another area where the new customer can be quickly confused and sometimes overwhelmed with the number of available choices. Motors can range in price anywhere from around $8 to over $300! It is possible to have just as much fun – especially in the beginning – with a motor that is very inexpensive as it is with the ultra-sophisticated models. Again, you simply trust your professional track owner to sell you something that is within your budget and learning curve. Chassis – Let me see do I buy a “stamped steel” or a “laser-cut” EDM or a “brass-wire” combination or what? Again, there are numerous styles available, depending upon what class or style of car you want to buy and race. My recommendation? Buy a good “starter kit” at the raceway which has a car already built and “ready-to-drive” – usually has a steel chassis which has been “formed” and all the parts are lovingly assembled for you at the factory. The kit also has the “hand control” you’ll need to “drive” the car around the race tracks. Some of these kits also have a few basic tools and extra parts. These kits cost anywhere from around $50 to $100 and definitely the only way to go for someone just getting started in this fascinating hobby. Bodies…Bodies…And More Bodies! – Slot car bodies are as varied as people, and when you look on the wall at the slotcar raceway, you’ll be convinced. They are in all sizes and shapes for all scales and styles of racing. What you will see more of will be vacuum-molded of very durable “Lexan” plastic which resists tearing and damage. You can buy them “clear” and paint your own, or there are hundreds available that are already painted and detailed by a wide variety of companies. Whatever body style you choose, when it comes time to actually “race” it in competition, you’ll need to add a driver interior, three numbers and appropriate decals. After all this is “scale racing” merely smaller versions of actual race cars. For years many enthusiasts built plastic model kits, then mounted them onto slotcar chassis and raced them. This very popular style of racing is coming back strong and is called “hard-body” racing. For some there is nothing like the thrill of fender-banging a competitor and knocking parts off in crashes. Tires – If you were amazed at the number of available motors, chassis, and bodies, just take a gander at the racing tires they have in stock! They are manufactured in almost every color of the rainbow, but black has become the most popular in the past year or so. Prices vary according to the type of rubber used and the hub material. Some hubs are machined from aluminum – others from lightweight magnesium. Many styles of rear tires now have “white” lettering on the sidewalls, such as “Goodyear Eagle” and such. Some newer slotcar tires are made of what can best be described as “fish” rubber very smelly so keep away from your nose (they smell like dead fish)! You never have to worry about slotcar tires being “round” today like we did in the 60’s and 70’s. The manufacturing processes used today are extremely exact and they come right out of the package, ready to install and go racing. There are also different types of “front” wheels/tires which are used for non-scale racing. These are smaller, narrower, lighter, and are only on the cars because the rules state they must be there. Tools And Other Parts – You’ll walk around many raceways open mouthed, looking at regular customers and their large “slot boxes” crammed full of all sorts of tools and electronic gadgetry. Who knows if you get into this like many of us have, you’ll end up with something very similar. Don’t worry about it at first add what you need as the need arises.